I created a new ruby plugin that is used by plamoni’s “Siri Proxy”, a proxy server for Apple’s Siri assistant. This proxy server allows for the creation of custom plugins that can intercept recognized speech and perform virtually any function imaginable (programmable, scriptable). 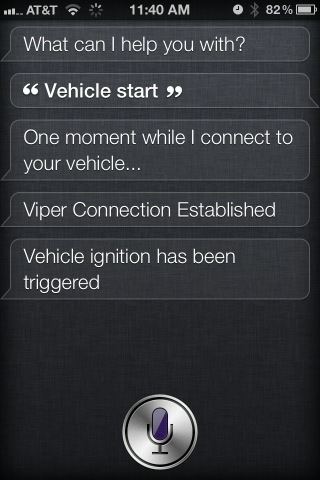 The “Siri Proxy” plugin I wrote handles interaction with a php script that runs on my web server. The php script, which I developed months ago for personal use, allows me to send commands to my car which has a Viper SmartStart module installed. Current commands accepted are: “Vehicle Arm”, “Vehicle Disarm”, “Vehicle Start”, “Vehicle Stop”, “Vehicle Pop Trunk”, and “Vehicle Panic”. I may change the command wording a bit later. This was just a proof of concept. We’ll see. More info upon request, demo video coming soon!